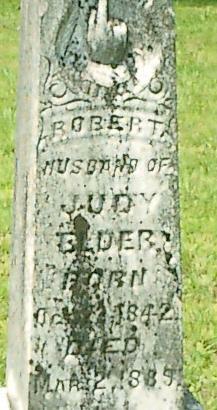 Robert Elder was enrolled in the 17th Infantry on October 28th, 1861. He was mustered in on January 4th, 1862 at Calhoun for a three year term in Company E prior to consolidation, and then transferred to Co. C. He was listed as a deserter, being absent on August 1st, 1862 in Huntsville. There are no other entries in the AG Report. ABSENT may be a more correct title than "deserted" as given in the AG Report. Men in these sections were not with their unit upon muster-out. Some were hospitalized, others dead, others prisioners, and others no doubt AWOL.